A suspenseful game of Cold War chess, "The Mind of Stefan Miklos" gets my vote for the all-time best episode of Bruce Geller's Mission: Impossible (1966-1973). This third season installment -- originally aired in mid-January of 1969 -- commences with a close-up shot of Jim Phelps (Peter Graves) unlocking a small padlock to gain entrance to a secret location and receive his taped orders. The remainder of the episode involves how Jim unlocks the mind of his opposite number in a foreign intelligence unit: one wily and devilish mastermind named Stefan Miklos (Steve Ihnat). 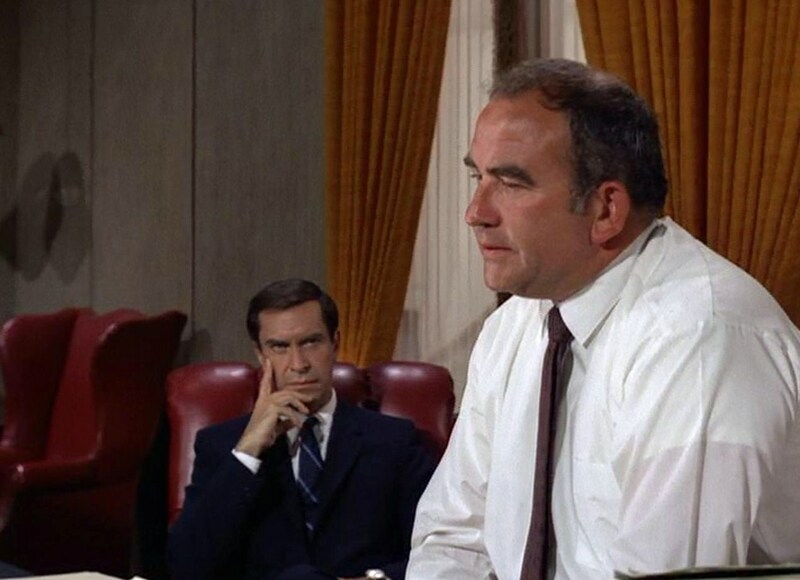 Specifically, Phelps must establish for the brilliant Miklos that a man named Townsend (Jason Evers) is still working for Miklos' government and is not, in fact, a double agent for the Americans, as has been suggested by another foreign agent, the conniving Simpson (Ed Asner). Because Townsend possesses top-secret but false information that the U.S. government wants Miklos' government to believe and act upon. Therefore, Miklos must believe that Townsend is still trustworthy, along with his information. Yet in order to believe this carefully constructed-lie, Miklos must "discover" what he deems the truth himself. He must see through a carefully-constructed "frame" of Townsend that Phelps has painstakingly created. His ego must be satisfied that he has arrived at the right conclusions. Good...because "The Mind of Stefan Miklos" is almost impossible to explain in terms of language, yet perfectly understandable -- perfectly plain -- in the watching. In large part this is due to director Robert Butler's frequent use of extreme close-ups and insert shots to highlight important narrative clues (an airport locker key, a passport, etc.). This is one reason I have always admired Mission: Impossible: because the series' creators always understood that television is primarily a visual medium and acted upon that knowledge. 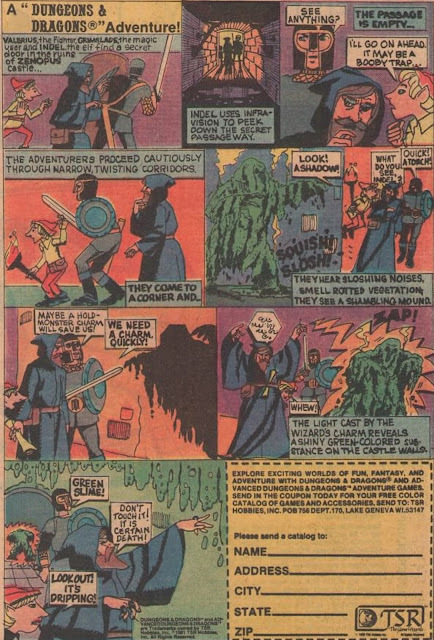 During the episode's opening briefing with Cinnamon (Barbara Bain), Rollin (Martin Landau), Willy (Peter Lupus) and Barney (Greg Morris), Phelps describes his foe, Miklos, as "cold, calculating and ruthless," and a man with "no weaknesses, no flaws," thereby setting up the character as a truly worthy adversary; one quite different from the run-of-the-mill villains featured on the series. Miklos is a man quite expert at mind-games, one not easily led to a conclusion, so Jim must make certain his plan for Miklos is not too obvious...but also not so byzantine that he can't decipher it. To employ a cliche, it's a tightrope walk all the way. The only way to defeat Niklos - a man "invulnerable" except "to himself" -- is for Jim to play on Miklos' own cunning; to manipulate his belief in himself and his abilities. To accomplish this, Jim and his team lead Miklos through a precise maze of small clues and have him think his way to the "right" (or is it wrong?) conclusion. Rollin plays Miklos, with Simpson. Those clues -- also revealed in true M:I-styled economical, visual storytelling -- involve small, simple things: a match-book, a painting and a small time discrepancy. 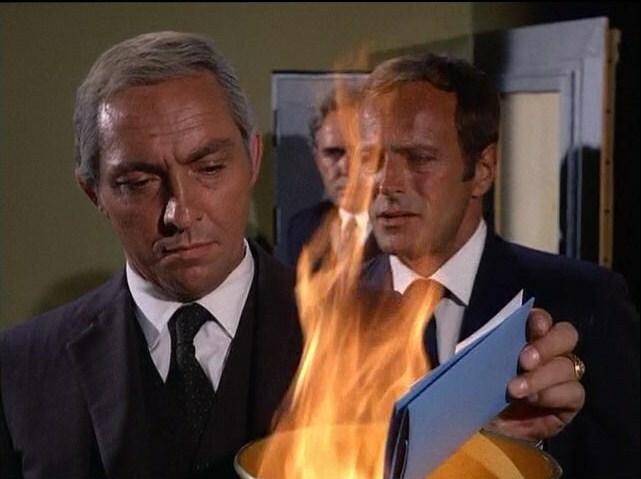 Each clue is surreptitiously offered to Miklos only once, but Phelps gambles on his enemy's photographic memory (shown as almost subliminal flash-cuts or freeze-frames in the body of the episode). Phelp's only advantage over Miklos in this "sting"-type tale is the fact that one foreign agent (Simpson) has never seen another foreign agent (Miklos). Therefore, Rollin impersonates Miklos with Simpson; and then turn around and impersonates Simpson with Miklos. What brass! Rollin plays Simpson, with Miklos. This gambit -- with Rollin playing two roles -- permits series regular Martin Landau to craft two truly fine, very different performances: one aping the suspicious Simpson (Asner) and one mimicking the cool, brilliant Miklos. What's even more amazing about these tour-de-force performances is that Landau dances between them, back-to-back, scene-to-scene and -- again -- the viewer always knows precisely "who" Landau is supposed to be. It's terrific work, and Landau pulls it off with real joie de vivre. 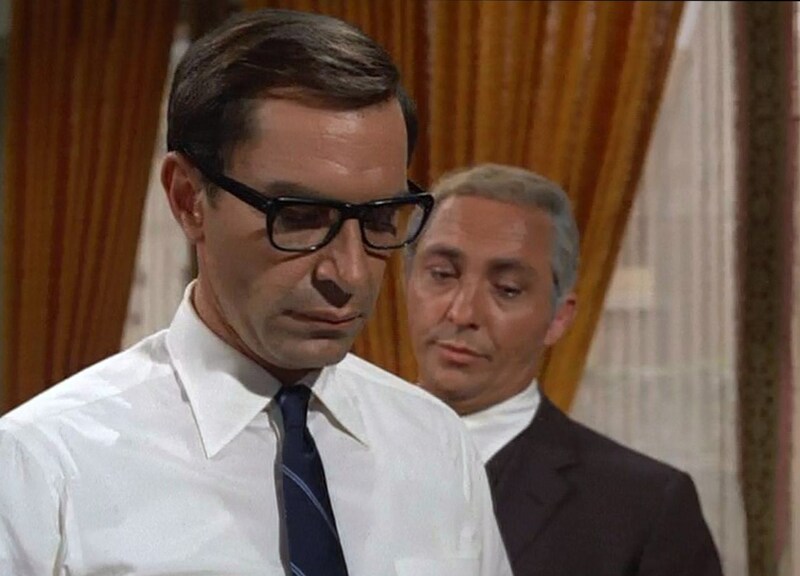 If you look at the two photos of Rollin featured in this post, you can see that Landau's face actually looks different when he's playing Miklos and Simpson, but no make-up or prosthetics are employed. It's all done in the way this actor carries himself. The tension in "The Mind of Stefan Miklos" keeps spiking for two reason, primarily. The first involves split-second timing. Barney and Willy must get Rollin's photograph into a hollow statue base, taking out Asner's photo in the process. But Miklos is en route from the airport and arrives to pick up the statue (and the secret package inside) early...necessitating Barney speed up his delicate work (which involves cutting through a display shelf with a saw...). Here the plan nearly falls apart. 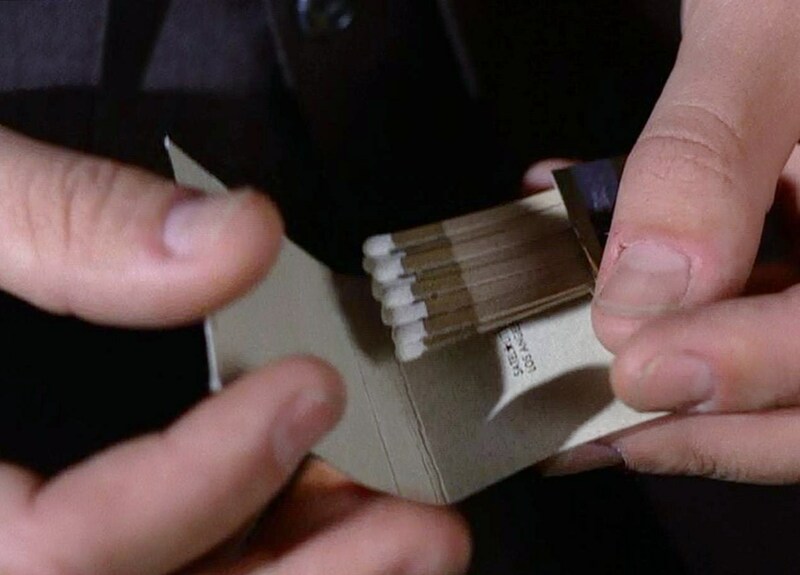 The matchbook of a left-handed man? The second reason for suspense involves the fact that Jim's entire strategy hinges on the idea that Miklos is that "cool, calculating" mastermind, and not a man subject to whim or the vicissitudes of the moment. At one late juncture, Jim realizes how much is riding on his assumption about Miklos' character. "He's letting his emotion affect his reason," Jim complains. "He's never done that before. Maybe I was too clever. Maybe the matchbook and the painting and the time discrepancy were too subtle for him to pick up!" Finally, Miklos does fall into Jim's trap. 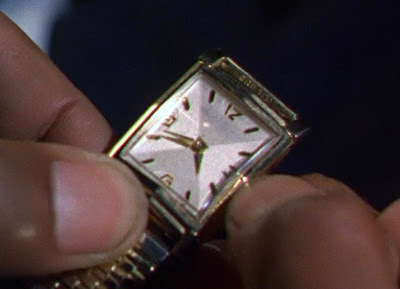 He sees through the carefully orchestrated frame job, and puts together the final three clues (the aforementioned match book, painting and time discrepancy.) He thus concludes that since someone is trying to sabotage Townsend, his information must be true...and accurate. Jim has led him to his downfall. And finally, this is why this Mission:Impossible episode is such a classic. Miklos -- his conclusion reached -- stops to experience a moment of empathy for his unseen, unnamed opponent (Phelps). "I wish I could meet the man that masterminded the operation," he says. "He played the game brilliantly, but he lost. It'll destroy him." The irony here is powerful. Miklos doesn't know it, but he's actually talking about himself. He has arrived at the wrong conclusion (that the information belonging to Townsend is correct) and it will, indeed, destroy him. Miklos played the game well, but Phelps played it better. What I adore about this moment, is that just as Miklos notes how "losing" will "destroy" his unseen nemesis, the episode cuts away from Miklos to a close-up of Jim. Yet Jim is not gloating or swaggering at having beaten his genius opponent. Instead, he is composed and there's sympathy evident on his face. He knows what Miklos does not; that Miklos is speaking about himself. Game over and mission accomplished: Miklos believes the wrong man. Jim also knows that there but for the grace of God goes he. It could have very easily been Phelps and the Americans who were "tricked" in such an elaborate covert operation. The roles might have been reversed. What the viewer thus detects of Jim Phelps in "The Mind of Stefan Miklos" is this sense of respect for the opponent and for the game. But also Phelps' intrinsic humanity. He executed the checkmate perfectly, but he still feels compassion for the loser. He knows there are professional and personal consequences for the (brilliant) Miklos. 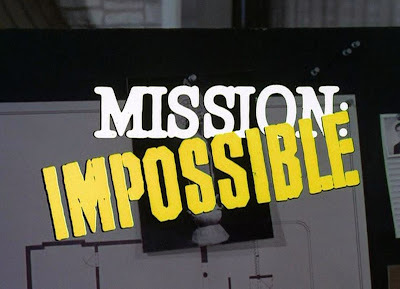 Moments like this -- told only with a silent expression on a chiseled face or through clever editing selections -- put truth to the oft-told lie that Mission: Impossible was a show just about the job, and never about the people doing the job. In "The Mind of Stefan Miklos" the viewer gains a clear sense (again through the careful visuals) of Jim's respect for his enemy, and also the jeopardy that Jim puts himself in every week to defend this country. The episode thus becomes very much about character. For Jim, this is not just an impossible mission...it's personal.